Asparagus is a sure sign that spring is around the corner and with it's sweet and tender flavor, it's a vegetable that works in so many different recipes. From a One Pan Lemon Garlic Chicken and Asparagus to Grilled Lemon Asparagus with Feta to Sheet Pan Salmon with Asparagus and Sweet Potatoes, this nutrient rich vegetable can be the star of any meal. 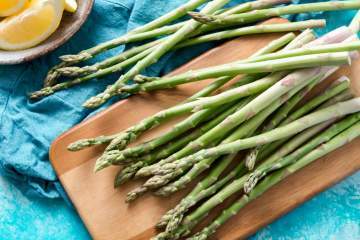 With just 20 calories per cup and high amounts of folic acid, Vitamin K, and Vitamin C, asparagus is not only delicious but its incredible good for you. Asparagus is not only delicious, this tasty green veggie is packed with nutrients and has lots of health benefits. Learn all about asparagus including nutritional info, how to prep it, and tons of recipe ideas.